The Crumbug (ヒトクチパンモドキ?, lit. : "Bite-Sized Pseudo Bread") is an enemy found in Hey! Pikmin. It is essentially a small, cuboid Breadbug. 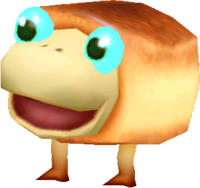 Unlike normal Breadbugs, however, this species has the ability to eat Pikmin. It simply walks straight forwards and occasionally turns around. Particularly: Get the health from the game files. The Crumbug's only move is to pace back and forth, quickly eating any Pikmin that happen to be in the way. If it falls to a lower elevation, it won't be able to climb back up and will continue to pace at the lower level. Crumbugs do not drop any Sparklium when killed. To do: Describe each location. The Crumbug is a common enemy in the game. It can be found in a variety of different environments, like caves, fiery wastelands, and even poison swamps. However, it is notably absent from Ravaged Rustworks, Leafswirl Lagoon, and Snowfall Field. This may be because they are replaced with the similarly weak Red Bubblimps, which are found commonly in Ravaged Rustworks and Snowfall Field. They are probably missing from Leafswirl Lagoon because most enemies with low health in the sector fly, contrary to the Crumbug. Crumbugs can be defeated with a single Pikmin thrown directly onto their backs. It should be noted, however, that one should take caution when aiming; Pikmin will die if they come into contact with a Crumbug in any way that isn't from being thrown onto them. This includes Pikmin touching them from behind while running back to Captain Olimar. If one is falling right above you or your Pikmin, the best thing to do is attack its bottom, as to kill it before it lands and causes harm. "Crumbug" is a combination of "crumb" and "bug", as a play on the pun used for the Breadbug's name, since a crumb is a small piece of bread. The cutscene with the first Crumbug in Hey! Pikmin. A Crumbug in a cutscene in Cavern of Confusion. A cutscene with a scared Crumbug in Serene Stream. Many Crumbugs in a section of The Hollow Sky. Two Crumbugs walking on dirt blocks in Septic Swamp. This page was last edited on February 28, 2019, at 20:47.